Close to 19 million brave men and women across America put their country before themselves and served in numerous wars to ensure the freedom of other nations, as well as our own. Selflessness turned these ordinary people into heroes. Today, Americans commemorate Veterans Day to remember and honor their sacrifices, courage, strength and humility. It’s also a time to remind ourselves that while millions of these Americans battled enemies on land, at sea and in the sky, so many of them were unfairly exposed to asbestos. Because of years of asbestos exposure on ships, barracks and other military vessels, veterans account for more than 30 percent of all cases of mesothelioma, an incurable asbestos-related cancer. As we take time to honor their service, let’s raise awareness of the deadly disease that unfairly targets veterans and learn what you can do to support a veteran today. For decades, the military extensively used asbestos in the Army, Navy, Marine Corps and Air Force. Valued for its high heat resistance and fireproofing abilities, the military used the material from the 1900s to the mid-1970s. It wasn’t until the ’70s that the military began to limit asbestos use. By that time, it was already too late. Exposure to asbestos is linked to several health conditions such as asbestosis, mesothelioma and lung cancer. Because of the long latency periods of most asbestos-related diseases — about 20-50 years before symptoms show — many veterans do not take proactive steps to ensure an early diagnosis. If the disease is diagnosed in its earlier stages, there are many treatment options that can help veterans. The U.S Department of Veterans Affairs offers veterans access to mesothelioma specialists across the nation. Veterans may also qualify for free treatment if they file a VA benefits claims. If you are a veteran who worked around asbestos during your military career or know of a veteran who was likely exposed to the carcinogen, there is help. 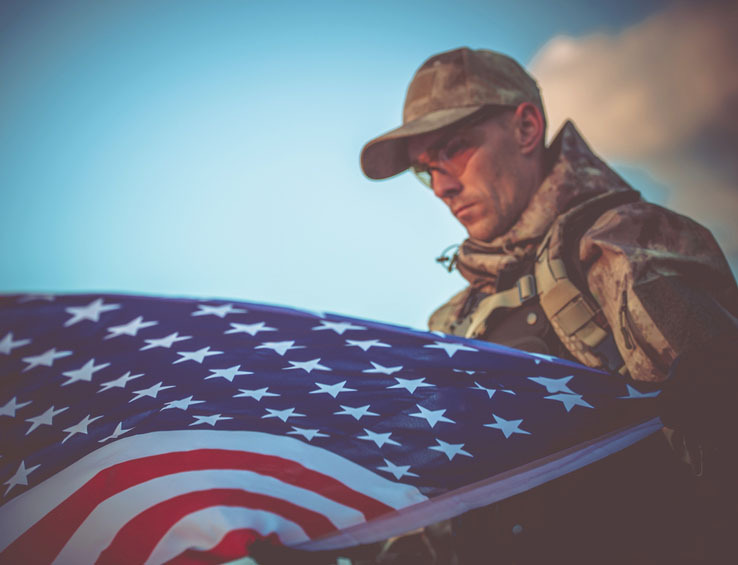 Often, the initial signs and symptoms of mesothelioma are so subtle that veterans ignore them or think they are signs of a less serious condition. Symptoms may include dry coughing, shortness of breath and pleural effusions. The rarity of the asbestos cancer also can lead to a misdiagnosis. As a result, many veterans are diagnosed with mesothelioma in its later stages when treatment options are limited. If you are a veteran, pay close attention to your health. Caregivers of veterans should also learn about the symptoms to look for and monitor any changes. If you or someone you love fought for our country and is now battling an asbestos-related condition, help is available. Veterans may receive free health care from the VA. Unfortunately, filing these benefits claims, dealing with a heavy backlog and possibly facing a denial and appeal, can be a grueling process, especially when time is of the essence. But veterans are not alone. A Patient Advocate can help veterans get the assistance they deserve. Despite the harm veterans suffered because of asbestos exposure during their military career, and the millions of American civilians who have died of mesothelioma, asbestos is not banned in the U.S. Enough is enough. Veterans deserve better. People deserve better. Take a minute to reach out to your local and state legislators about reducing the backlog of benefits claims, improving the service to veterans, employing more mesothelioma specialists at VA hospitals and banning the deadly substance. Make your voice heard. Now is the time to tell our government to stand up for what is right and truly make a difference on Veterans Day.